The International Soap Box Derby is going Down Under. 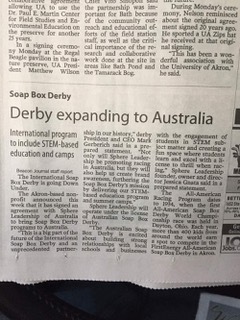 The Akron-based nonprofit announced this week that it has signed an agreement with Sphere Leadership of Australia to bring Soap Box Derby programs to Australia. “The Australian Soap Box Derby is excited about building strong relationships with local schools and businesses with the engagement of students in STEM subject matter and creating a fun space where students learn and excel with a license to thrill when racing,” Sphere Leadership founder, owner and director Jessica Gnata said in a prepared statement. The All-American Racing Program dates to 1934, when the first All-American Soap Box Derby World Championship race was held in Dayton, Ohio. Each year, more than 400 kids from around the world earn a spot to compete in the FirstEnergy All-American Soap Box Derby in Akron.